Photo by LORETTA JACKSON Jody Fox, assistant manager of Frizzhome Gardens, and Howard Frizzell, owner and manager, spent many hours last season, as seen here, in constructing and arranging a wide variety of planters for succulents, including aloe vera and dozens of varieties of cactus secured within ceramic dishes, terra cotta planters and other vessels that help beautify most any homescape or workplace. Local gardeners experiencing the winter blahs triggered by snow-crusted landscapes bereft of veggie plots or flower beds blazing with color, may take solace. New growth is jump-starting the season within the greenhouses of Frizzhome Gardens, in Bedford. Scented geraniums, whose withered roots take kindly to a languid submersion in potting soil, already are sending out roots that will clone the specimens into hundreds of siblings. Scores of varieties are growing there, along with other species of vegetables, flowers, herbs and tropicals. 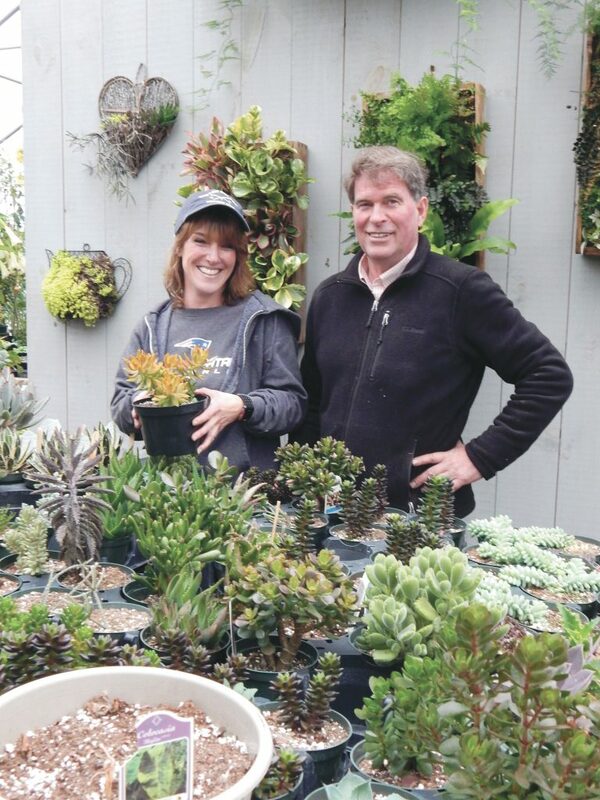 Howard Frizzell, owner and manager of Frizzhome Gardens, 270 Back River Road, perused on Sunday, Jan. 27, the 12 structures that over some acres shelter seedlings, cuttings and transplants now growing with sufficient vigor to soon warrant bigger pots. The greenhouses he tends, along with his son, Jeff Frizell, and longtime horticulture diva Jody Fox, assistant manager, at this time of year are stocked with pots and flats and decorative urns soon to become bearers of more mature flowers, herbs and vegetables. Elsewhere, ornamental trees and fruit trees soon will be stretching their tender leaves toward the springtime sun. 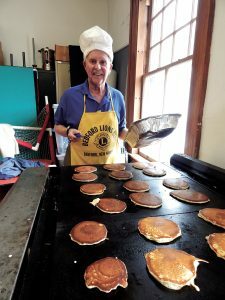 Howard has nurtured the property in Bedford since 1986, after moving from Nashua where he established his first nursery business, an enterprise launched with a lean-to greenhouse and cold frame in his backyard. His earliest steady customer was a local high-school coach who purchased plants to resell during team fundraisers. Today, his patrons come from many towns and cities. He said that he and his associates are dedicated proponents of offering each customer the right plants for the environment in which the plants will grow. Gardeners with small yards or little sunshine may find satisfaction in hanging baskets or container gardens suitable for lending beauty to a deck or front porch. Howard noted that most of his customers return every spring to stock up on the extensive supply of annuals and perennials he offers. Nevertheless, he is quick to encourage newbies, or gardening novices with limited experience, to try something new. Don’t be afraid to try, he added. More information on Frizzhome Gardens can be had by calling 644-0734 or by visiting online: frizzhomegardens.com.